The Town Foundation has used the money raised from the Pedal for Pounds 9 bike ride with Made By Cooper to supply 27 local schools with defibrillators. Initially the Town Foundation had been gifted the funds to provide 18 schools with defibrillators, before a further nine schools were able to be provided with the life-saving equipment. The schools that received defibrillators are schools where the Town Foundation already provides a breakfast, after-school club, or a Premier League Primary Stars programme. Representatives from the latter nine schools were invited down to Huddersfield Town’s PPG Canalside to take part in a training session on Tuesday 2 April. The other 18 schools had already taken part in a training session at the end of the 2017/18 season. Steve Moss from Purple Dog Ltd led the training sessions and demonstrated how the defibrillators work whilst also giving a short refresher on general first aid. 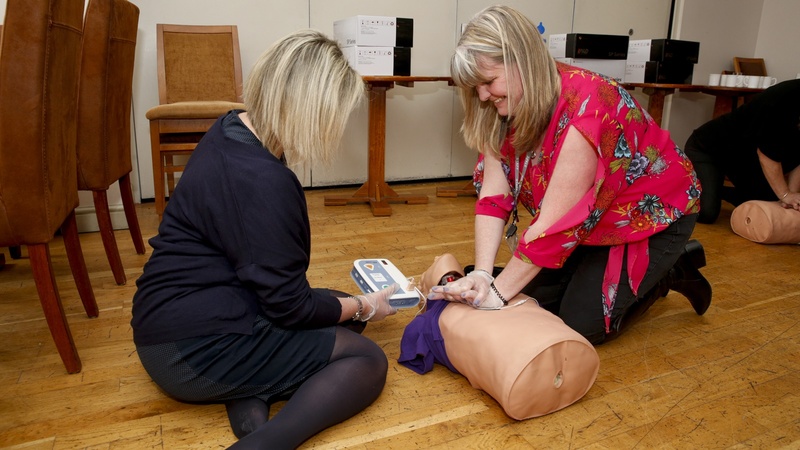 The attendees then had the opportunity to demonstrate what they had learnt using specially made training defibrillators. The Town Foundation works closely with Goals 4 Hearts, who source the defibrillators, register the schools with West Yorkshire Ambulance service and the charity is also always on hand to answer any questions regarding the equipment. Lee Orton started the charity after he suffered a cardiac arrest whilst on the football field, and thankfully, the Club he was playing for had a defibrillator on site which then saved his life. “The money raised from Pedal for Pounds 9 ride with Made By Cooper has helped us place 27 defibrillators out in the community and a massive thank you must go to all the cyclists and their sponsors for making this happen. “When the Foundation was made aware that they would be receiving a share of the funds, we wanted to make sure that the money was used for a specific project and placing the defibrillators in our partner schools was perfect.